Pet Emergency? Call us right away at (813) 991-6126! If you live in Wesley Chapel or the surrounding area and need a trusted veterinarian to care for your pets – look no further. Dr. Andrew Hong is a licensed FL veterinarian, treating all types of pets. Your pets’ health and wellbeing are very important to us, and we take every possible measure to give your animals the care they deserve. Animal Wellness Centre of Wesley Chapel is a full-service animal hospital and welcomes both emergency treatment cases as well as pet patients in need of routine medical, surgical, and dental care. Dr. Andrew Hong has years of experience treating serious conditions and offering regular pet wellness care. Beyond first-rate pet care, we make our clinic comfortable, kid-friendly, and calm, so your pet can relax in the waiting room and look forward to meeting our Wesley Chapel veterinarian. We are happy to offer a number of resources that enable you to learn about how to take better care of your pets. Please feel free to browse our site, particularly the informational articles. The best veterinary care for animals is ongoing nutrition and problem prevention, so becoming knowledgeable about preventative pet care is essential to the ongoing success of your animal’s health. If you have any questions, call (813) 991-6126 or email us (awcwcvet@gmail.com) and we'll promptly get back to you. Our Wesley Chapel veterinarian office is very easy to get to -- just check out the map below! We also welcome you to subscribe to our newsletter, which is created especially for Wesley Chapel pet owners. At Animal Wellness Centre of Wesley Chapel, we treat your pets like the valued family members they are. "Dr Hong is honest and have been using him over 20 years. I love how they are open 7 days a week. The staff are so nice and friendly. Great vet clinic right off 75 near wiregrass mall." "Love Dr. Hong, wouldn't take my doberman anywhere else!" "thanks to the vet here, my dog is all better from his sickness! This location has great service and the place is clean. everyone is friendly and professional." Dr. Andrew Hong has been providing complete veterinary care for Tampa, Lutz and the surrounding area since 1989. He attended Seoul National University, where he received his Doctorate in Veterinary Medicine Degree as well as a Master of Science Degree in veterinary clinical science and internal medicine. In 1982 he attended the University of Missouri at Columbia, where he received his Master of Science Degree in Veterinary Pathology. 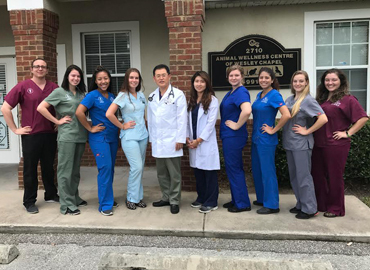 Also Dr. Hong finished his course at Chi Institute and became Certified Veterinary Acupuncturist in 2016. He loves trying herbal medication and acupuncture on patients with chronic disease. He enjoys playing golf on the weekends and he is also interested in classical guitar. He has three dogs and one cat; Clementine (Boxer), Onami (Maltese), Grace (Shiba Inu – left), and Elena (feline). He exercises his dogs by running them two miles every morning before coming to the office to ensure that they are as healthy as they can be. He is also a member of the ARAV (Association of Reptilian and Amphibian Veterinarians). My name is Mariah Hamilton, and I'm glad to be a part of the Animal Wellness team! I graduated in 2013 from HCC (an AVMA accredited college) with an A.S degree in veterinary technology. I have experience in working as a certified veterinary technician for four years, in different veterinary branches such as emergency, shelter, and private practice medicine. In my spare time I enjoy spending time with loved ones, walking/playing with my rescue dog, Brock, and going to the gym. I look forward to meeting you and your fur babies! Photo credited to Margaret Janicki of Margaret Janicki Photography. Vanessa started shadowing Dr.Hong in May of 2017 and was hired as a tech shortly after. She graduated from the University of South Florida with a Bachelors in Integrative Animal Biology. She has an interesting in exotic pets and hopes to become an exotic veterinarian. Kyra Okin, a high school senior, interested in becoming a veterinary technician in the future. She has two Dutch bunnies (Noah and Vixen) and a puppy named Devin whom she spoils and loves with all her heart. In her free time you can find her at the pool competing in synchronized swimming, baking or reading a good book. Jessica is a student at the University of South Florida majoring in animal biology, and has wanted to be a vet her whole life. She plans on attending vet school and possibly specializing in equine medicine or oncology. Sara started working for us in October 2017. She is a 2018 graduate of the veterinary technology program at HCC and is a Certified Veterinary Technician. In her free time, she loves going to the beach, spending time with her husband and spoiling 3 dachshund/chihuahuas. Tiffani Davis is proud to be working at the Animal Wellness Centre of Wesley Chapel. She has known that she has wanted to work with animals since she was 7 years old. She is a student at St. Petersburg College and is currently going to school to be a Certified Veterinary Technician. Tammy Hadlock started working for us in November 2018. She was born and raised in Germany and wants to become a Certified Veterinarian Technician.